The 60th Big 33 Football Classic will take place on Saturday, June 17th at Landis Field (Harrisburg, PA.) We look forward to the fifth game of the series between Maryland and Pennsylvania. Kickoff is at 7:00 pm. Also join us for the Fan Experience & Awareness Festival...FREE Pre-Game Activities at Landis Field from 3:00 - 6:30 p.m. This will be a festival with various games, inflatables, food trucks, entertainment and many booths, providing special emphasis on social services for families and featuring educational and prevention services. 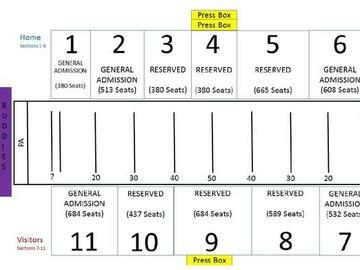 Below is a diagram of the seating at Landis Field.